Wednesday, December 18, 1996 was a special day for Elvia Staines and her family. 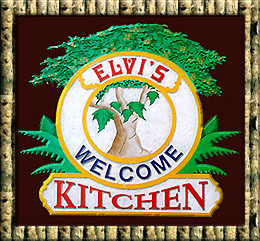 Elvi's Kitchen, a twenty year old San Pedro restaurant was awarded the International Gold Star Award for Excellence and Quality. Master of Ceremonies Rene Villanueva introduced Minister of Tourism and the Environment, Hon. Henry Young, Mayor of San Pedro Manuel Heredia Jr., and the Town Councilors and standard bearers Louis Sylvestre of the United Democratic Party and Patty Arceo of the People's United Party and the star of the evening, Mrs. Elvia Staines. Villanueva recounted the restaurant's 20 year history and success story. 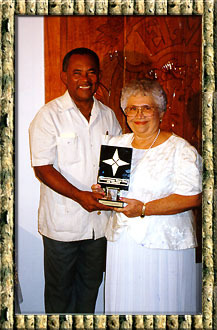 Starting as Burger Isle, the popular restaurant little by little expanded over the years to become the first Belizean business to win the International Gold Star Award. 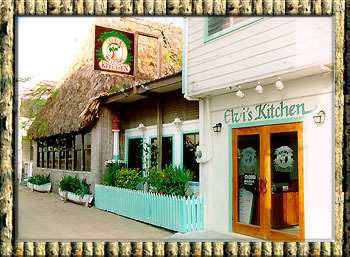 "The little place that once was a take-out has grown to a 1st class place that employees 30 Belizeans. The menu has grown from sandwiches and soups to international dishes and a gold star for quality." Mayor Heredia congratulated Mrs. Staines and her family. He said that when Elvi's was tiny it was number one and even though the restaurant has grown it has maintained its high quality and is still number one. Gach Guerrero offered a toast saying, "Thanks for the best food, which helps to keep San Pedro the number one tourist destination." "We can be proud here this evening," said Minister Young. "This is an occasion which the Staines family and all Belizeans can feel proud. Because an establishment may be humble doesn't mean it cannot be # 1. This restaurant is not humble, it is crafted of local materials, not chandeliers, but beautiful Belizean woods. The employees give their best. Even before I came to this position, I always felt comfortable and well cared for here. 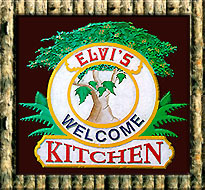 60% of Elvi's menu is local dishes. That's a good part of their success. 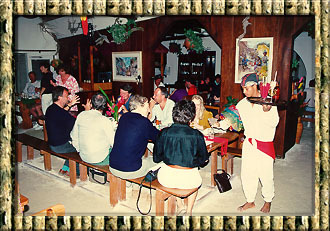 People come here from abroad to feel, taste and experience local culture, food and music. One other thing I will remark on, I have never experienced anyone here with a smirk - they are always with a smile. The Customs Department needs to travel to foreign countries to learn how to treat people. Maybe we should send them to Elvi's so they learn the right way. Congratulations Miss Elvia and family and staff, the country is proud of you, San Pedro is proud of you." Elvia Staines graciously thanked the Minister and all those present and announced that she wished to especially thank the staff. Special certificates and gold medals with a gold star were presented to the surprised staff: Bonnie Pascascio, Sheri Garbutt, Sylvia Chuc (10 years), Amparo Gutierrez, Lily Kumul, David Alex Mazin and Brian Wade. Also honored with certificates and medals were Armando Graniel who built the restaurant and has remodeled it over the years and Wally Nuñez Jr.' for his electrical skills and keeping the equipment functioning. They were both thanked for performing their skills so well. 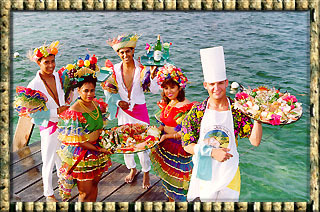 Lobster season in Belize is June 15th through February 14th each year. Especially during that time, we offer a variety of delicious lobster dishes. In a saucepan melt butter and saute onions until tender. Add sweet pepper and cilantro, cooking it for one more minute. Then add salsa mexicana, blended tomatoes, whole kernel corn, sweet peas, chicken consomme, and black pepper. Stir. REmove from heat. Serving suggestion: Serve with black beans, guacamole, fried plantains, and flour tortillas.